Good results of the binomial Spanish in Monpazier Equestrian Raid (FRA). Test run on this past weekend, on 30, September 31 and August 1, where we have run a series of tests CIS. Oier Etxenike completed a superb weekend in Monpazier: Friday was fifth in the CEI2 * riding "Hodei", while Saturday won the CIS * with "Foque de Quijas”". In the various French tests dozens of Spanish competed. 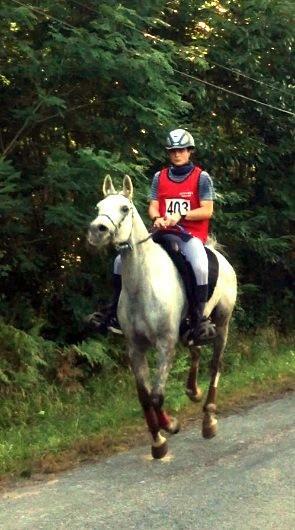 On Friday August 30 ran in France CEI2 * Monpazier, a test of 130 kms. which had among its 73 participants to 12 Spanish. Riding "Hodei" which debuted in the distance, Oier Etxenike was fifth, with an average speed of 19.98 km. / Hr. (25.72 kms. / Hr. In the fourth and final phase). The test was won by the Emirati Rashid Mohd Ibrahim Al Baloushi, who made an average of 20.26 kms. / Hr. with the horse Extremadura "Bucanero". Besides Etxenike, which last year was second in this race with "Farad", were classified four Spanish: Ander Mato (23 º with "Kin"), Aiora Urkiaga (29th with "Hiaben"), Olatz Areitio (30th with "Ainhoa ​​Catharilis") and Miguel Astiz (40 ° on "Lan Bugati"). The next day was even happier to Etxenike, as the Gipuzkoa and "Foque de Quijas" were imposed on 39 rivals in the CIS *, with an average of 19.62 kms. / Hr. (24.54 km. / Hr. On the third and final phase.) Among the 24 was also classified Eulalia Gonzalez (16th with "Polo de Galeon"). The CIS3 * (39 classified 66 participants) was won by Cecile Totain locally, with the former Alex Luque mare "Koheilan Kincso" (18.45 kms. / Hr.). Eulalia Gonzalez also qualified in this test, it was 14th on "Gazal Biborka". Laia and Agda Muixí were 25th and 26th with "Tbo Rematador" and "Vaincre Kossack" respectively, while Rachel Pratcorona was 32nd ("Erika"), and Xabier Aitor Unanue, 34 ("Ab-Zita"). Finally, in the CEI2 * 2 × 70 (31/47), won by local Sebastien Miermont and "Badra d'Aiza" (19.69 km. / Hr.) Were classified Xavier Maxenchs (7th with "Killa de Masferrer ") and Juan Carlos Ruiz de Villa (17th with "Rohf Joram"). Click on the following link to view the results: CIS Monpazier." Raid on the Camino de Santiago for Madrid 2020.